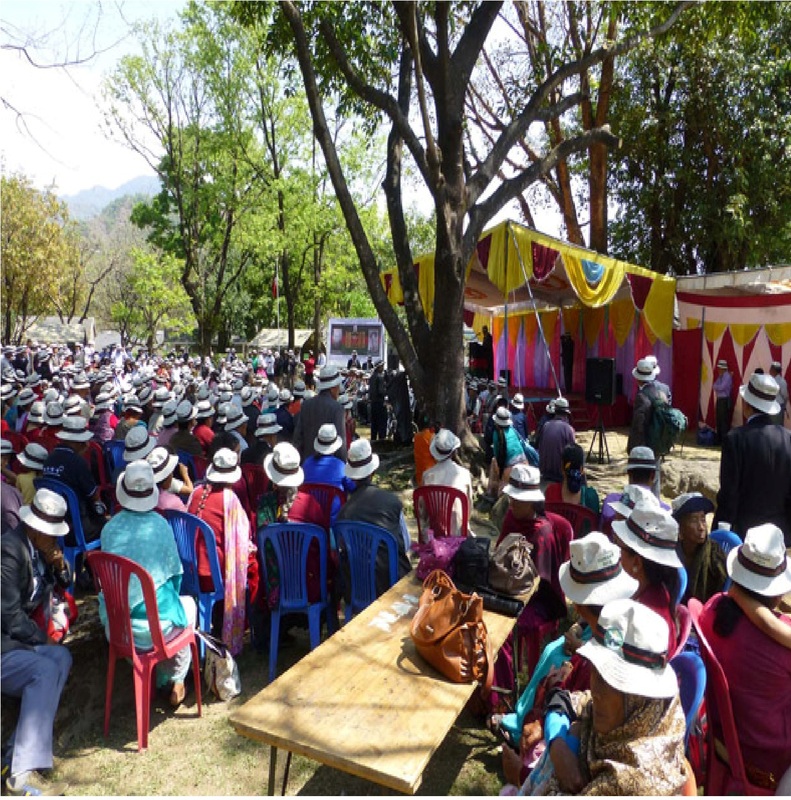 The 6GR Durbar held in Pokhara on Saturday 30 March 2013 was a huge success with a gathering of some 1,200. In addition to those travelling from Kathmandu and other parts of Nepal, groups came from Darjeeling, Hong Kong and the UK. Nearly a hundred British Officers and their families came from the UK, Europe, the USA, Canada, Australia and China. 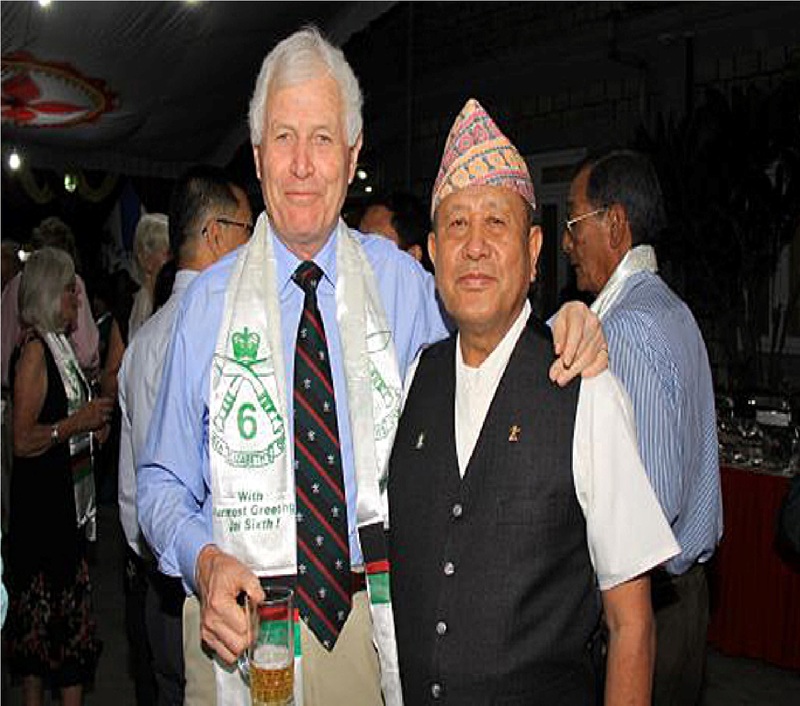 As a welcome to overseas visitors, the night before the Durbar itself a reception was held at the Gurkha Haven Hotel of Major Gyan Bahadur Gurung, Chairman Nepal Branch of the Association. At the last 6GR Durbar in 2005 the Battle of Mogaung was especally remembered and Hon Lt Tul Bahadur Pun VC was the guest of honour. Sadly, Tulbahadur Saheb is no longer with us. However, this year Elizabeth Allmand came from Australia in honour of her uncle, Captain Michael Allmand VC, who also won his VC at Mogaung. Other very welcome guests were Anne Griffith, widow of Lt Col Adrian Griffith, and their two daughters, all of whom had spent so much time and given so much in Pokhara. The venue, BGC Pokhara, with kind permission of Colonel Andrew Mills, Comd BrigNepal, and thanks to the great support from the acting OC and his staff, was perfect. The weather too was the nicest day for a week with bright sunshine making the Centre’s leafy chauntaras popular places to sit. After the welcome speeches given by Lieutenant Purna Bahadur Gurung, the Durbar Committee Secretary, Major Gopal Bahadur Gurung, Durbar Chief Coordinator, Brigadier John Anderson, President 6GRRA, and Major Gyan Bahadur Gurung, there was a minute’s silence to remember those who had died in the last year. Some seventy pensioners 80 years old or more were then recognised by presentation of khadas and certificates by Major General Ray Pett, former Colonel of the Regiment and President 6GRRA, by Brigadier John and by Major Gyan. 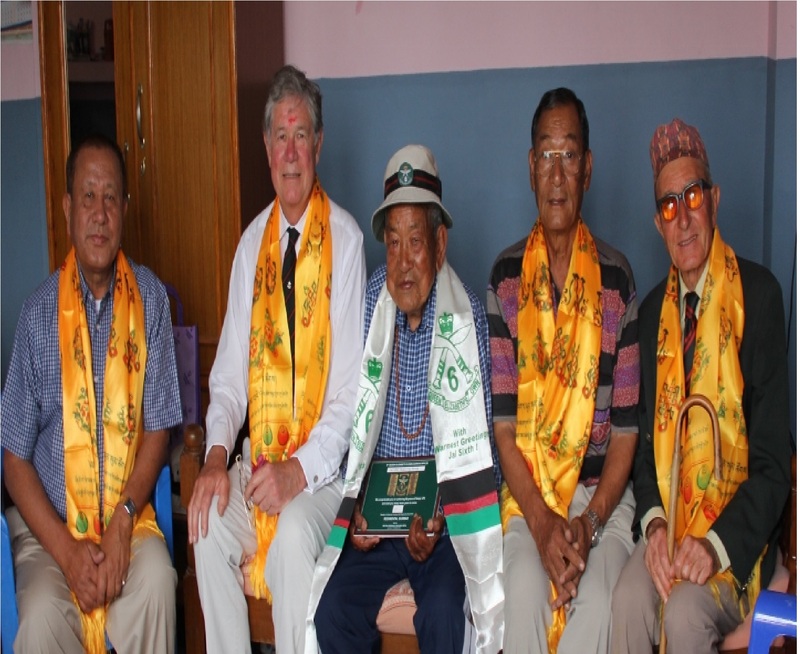 One of those unable to be present was 6GR’s oldest pensioner, 99 year old Capt Bakansing Gurung. Enlisted in 1933, he served with 1/6th in India’s North West Frontier and in Burma during the war, where he was seriously wounded and only rejoined the Battalion after war’s end. He opted to stay with the British Army, served in Malaya with the 1st Bn and retired as a Captain in 1957. Remarkably, Bakansing has lived to see his great-great-great-granddaughter and of his 78 descendants, 72 are still alive. Bakansing lives near Lt Col John Cross and his story is told in John’s book Gurkhas at War. And it was John who arranged a visit to Bakansing’s house on 28 March for him to be presented with his khada and certificate by Brigadier John and Majors Gopal and Gyan. After the opening formalities were over old friends searched each other out, often not having seen each other for many years. Old stories were re-told, beer was drunk, delicious tipan-tapan and bhat was served until, late in the afternoon, good-byes had to be said. “See you at the next Durbar!” was heard many a time. All agreed what a wonderful occasion this had been. 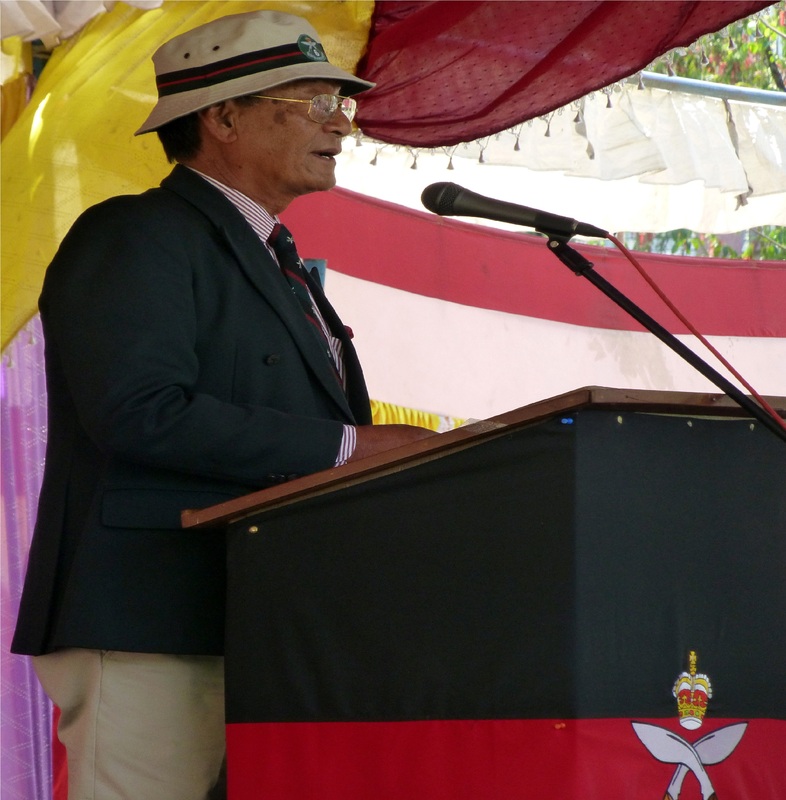 But, it was only possible with the generosity of those who had donated towards the Durbar costs and with the superb bandobast of Major Gopal Bahadur Gurung, the Durbar Co-ordinator and his first class committee. 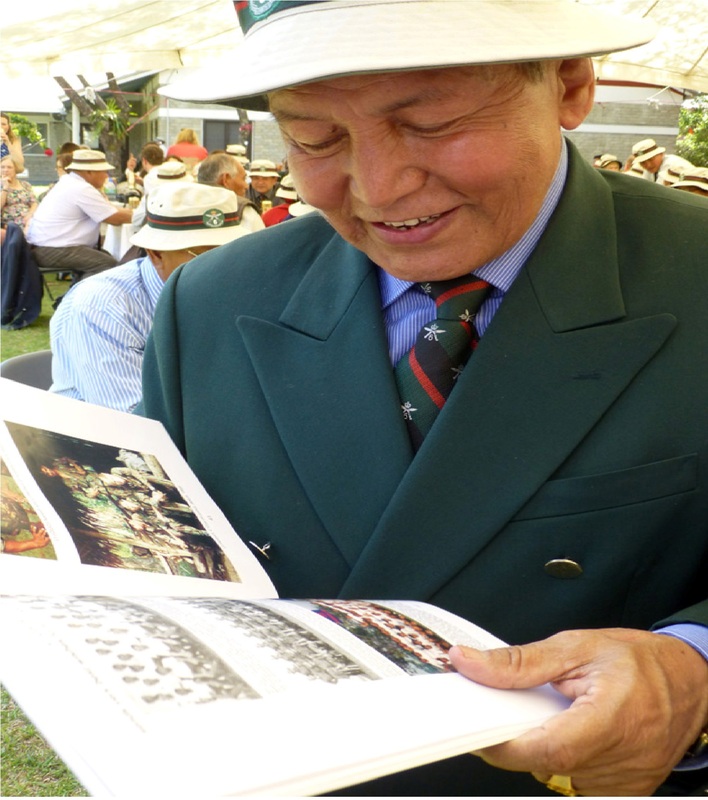 Below – Capt Birbahadur Thapa, renowned singer, dancer, Nepal Cup footballer and sometimes clerk enjoys the Durbar Brochure containing hundreds of photographs of men who had served from the 1950’s onwards.